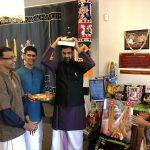 Categories: Divine Names, Sri Muralidhara Swamiji. 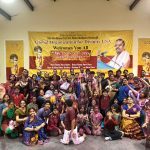 Dallas Texas was blessed with Namadwaar by Sri Swamiji’s grace this March. 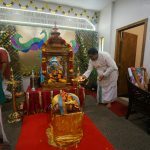 It was a 4-day celebration, happily celebrated by devotees all around the US and Canada, in the presence for Sri Ramu ji and Sri Poornima ji. By Guru Maharaj’s grace, the joyous occasion fell on the most auspicious and appropriate day of Sri Chaitanya Mahaprabhu Jayanthi Day. 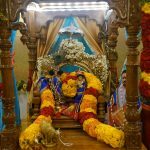 On March 1 2018, the festivities began with Sri Swamiji’s Paduka Pravesham by Sri Ramuji, along with Sri Madhuri Sakhi sametha Premika Varadhan pravesham by Sri Poornimaji, in all pomp and glory while the devotees chanted the Mahamantra and rendered several of Sri Guru Maharaj’s kirtans. After welcoming Sri Swamiji’s holy Padukas and the divine couple, there was the ceremonious lighting of the lamps. 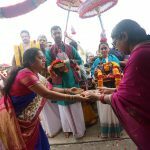 This was followed by Thirumanjanam of the Divine Couple and the recital of Srimad Bhagavtam, Dasama Skandam. The devotees were blessed to watch Sri Swamiji’s Anugraha Bhashanam. 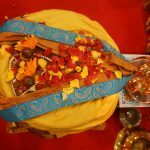 After that, was a grand procession of the Lordship on Gaja Vahana. 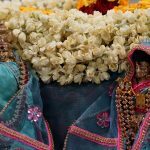 Soon after, Ashtapadis were rendered by the kids and devotees. The evening program began with a beautiful Natyanjali by Nrithi Subramaniam from Minneapolis. 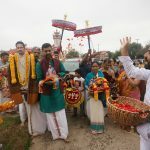 Later, Sri Ramu ji discoursed on “The Path – Sweet, Sure & Simple”, which extolled the power of Nama Sankirtan as the path, the means and the destination. Then came the most-awaited moment! 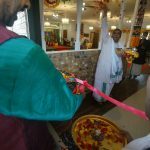 The formal opening ceremony of Namadwaar by Sri Swami ji from India. The day concluded with Divyanamasankirtan and Dolotsavam. Day 2 began with Prabodhanam, followed by Srimad Bhagavatha parayanam of Dasama Skandam, chapters 4-54. In the afternoon, Ashtapathi were sung. Nama was chanted continuously in parallel. 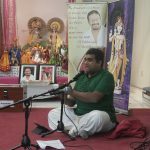 In the evening, Sri Ramu ji continued his discourse series on “The Path – Sweet, Sure & Simple”. 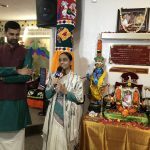 Sri Ramuji delivered a thought provoking message of how and why chanting Bhagavan Nama is so important in this Kaliyuga. He expounded on Sri Swamiji’s Mahamantra Kirtan, reiterating and reinforcing our faith once again in His Nama. 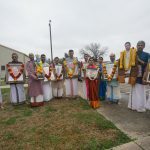 In preparation for the upcoming Sri Radha Madhava Vivaham, the devotees enthusiastically celebrated the Divine Couple’s Janavasam while singing many of our Guru Maharaj’s kirtans. 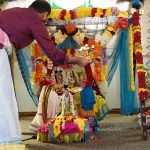 The day’s event ended in Oonjal Seva of the Divine Couple, followed by Dolotsavam. 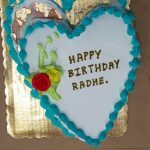 Radha Kalyanam was the highlight of Day 3 festivities. 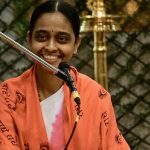 Following this was the mesmerizing Sangeeta Upanyasam by Sri Poornima ji on “Sarvottamam Sri Hari Bhajanam”. 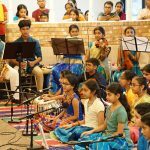 In the evening, the Gopa Kuteeram kids presented a melodious musical – “Mahamantra Madhuryam” – an ensemble of various instruments and vocal offering to the Lordship. It was the presentation of the 16 different language version of the “Kaliyayum Bali kollum..” song. This was followed by Sri Ramu ji’s third day discourse series, which was heard by the devotees with rapt attention. 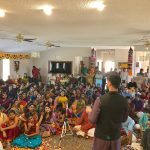 Being the weekend of the Holi festival, all the devotees got together in the Mother Meera Abode Hall and waited for the Lordship to arrive. 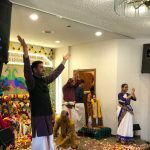 When the divine came in on procession with the other devotees, the celebration began with throwing colors on each other and dancing around the Lordship to the tunes of various kirtans of Sri Swami ji in joy! On Day 4, Sri Poornima ji lead a melodious bhajan session rich in Meera bhajans, followed by procession of the Lordship on Garuda Vahana. 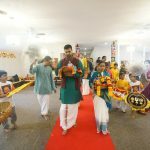 The procession lead to Mother Meera Abode hall, where kids and ladies danced around the divine couple. 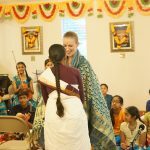 Later, there was discourse by Sri Poornima ji on the greatness of Namasankirtan. After a short break, Sri Ramu ji concluded his discourse series with a profound talk on the greatness of Nama in this age. 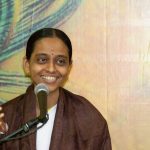 In addition to the satsang devotees, several new members attended and enjoyed the celebrations, especially the discourses by Sri Ramuji and Sri Poornimaji, and were captivated by the simplicity of the philosophy and the ease of this spiritual path. 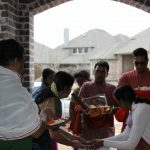 The Dallas GOD Satsang Family offer their prayers, and heartfelt humble pranams at the Lotus Feet of our Sri Swamiji, who has held each one of us in His heart and answered our prayers for this Namadwaar in Dallas.